Here we are, a few weeks after the official drop of The Road Darkens saga expansion, and I am loving all the new cards — encounter and player alike! And love it or hate it, Gandalf has gotten some serious attention in this box with the addition of his hero iteration and his new ‘toys’. One of the latter is the Wizard Pipe and this card in particular has caused me to revisit the possibilities of a pipe deck. I myself was once a practitioner of this gentle art, and have considered taking it up again in recent weeks. Whether it’s the change of season, or just the simple, satisfying act itself, I’m presently on the hunt for a decent long-stem pipe. The Professor himself was, of course, an avid pipe-smoker, having retired from the less academic but more fashionable habit of cigarettes in his youth, as were many of his compatriots. He is rarely seen in his pictures without a pipe hanging from his mouth. As such, he could not help but work the pipe into his stories. This was, probably, accidental — The Hobbit was not initially a part of the greater mythology of Middle-earth. But almost immediately Gandalf comes upon Bilbo smoking a giant pipe (think of the saxophone-sized thing we see at the beginning of Nosferatu). Then came the unexpected party and Thorin ‘ was blowing the most enormous smoke-rings, and wherever he told one to go, it went-up the chimney, or behind the clock on the mantelpiece, or under the table, or round and round the ceiling’ and before you know it the pipe, and tobacco, are a part of the histories of Middle-earth, so much so that it gets its own segment in the Red Book in Concerning Hobbits. 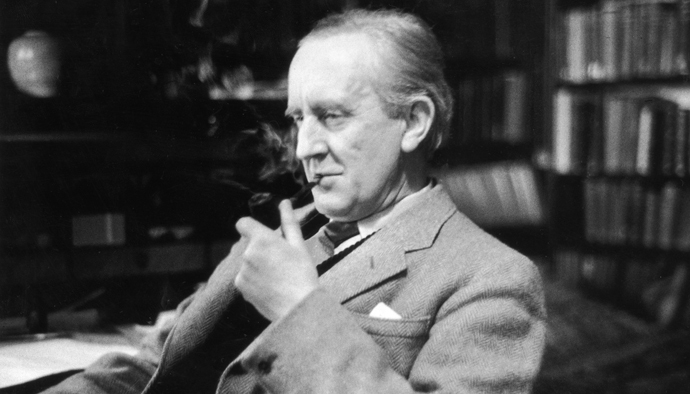 There is another astonishing thing about Hobbits of old that must be mentioned, an astonishing habit: they imbibed or inhaled, through pipes of clay or wood, the smoke of the burning leaves of a herb, which they called pipe-weed or leaf, a variety probably Nicotiana. A great deal of mystery surrounds the origin of this peculiar custom, or ‘art’ as the Hobbits preferred to call it. While in The Hobbit, leaf is referred to as ‘tobacco’, Tolkien cut it out of The Lord of the Rings because it is a far too recent word for a mythical pre-history as it was adapted from the Spanish in the 1500s when the practice and trade began to pick up. So in Rings it is called ‘pipe-weed’. This is not marijuana. The idea of Hobbits as stoners, reinforced by the films, is simply a joke that’s gotten out of hand. Being rather conservative I’m sure Tolkien would be unhappy at best at the thinly-veiled references to pot that have probably been happening since American hippies got their hands on the books in the sixties. In any case, the Hobbits started it. 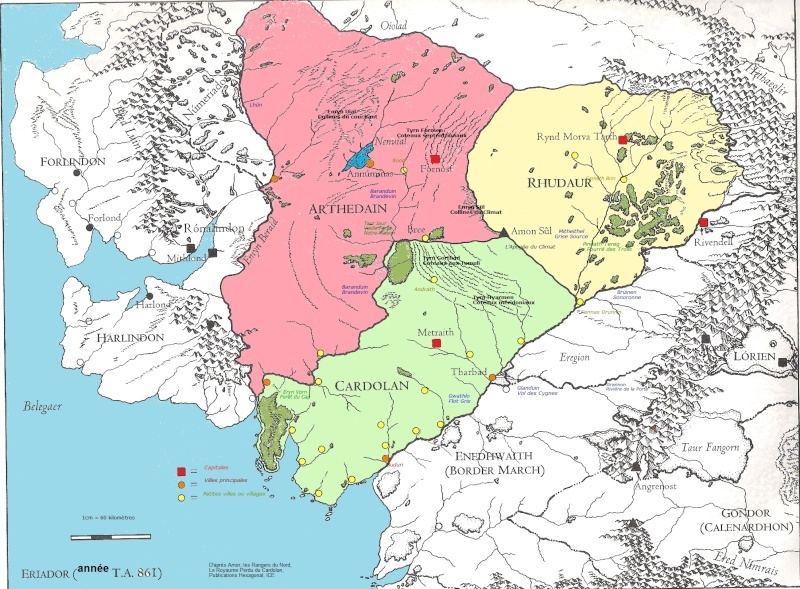 From them the practice spread to other folk of the North and West of Middle-earth: Rangers, Dwarves, and Men of Bree and from Bree (specifically the Prancing Pony) it was that these other folk found it. We can assume, after coming into contact with Meriadoc Brandybuck, that perhaps the Men of Rohan also took it up. Elves have, seemingly, no interest in the art. As the Company rests on the ruins of Isengard, Legolas says, ‘Time wears on, and the mists are blowing away, or would if you strange folk did not wreathe yourselves in smoke’. So the whole business is obviously very outlandish to him. No smoke and wine instead of ale; how very healthy those Wood-elves must be! 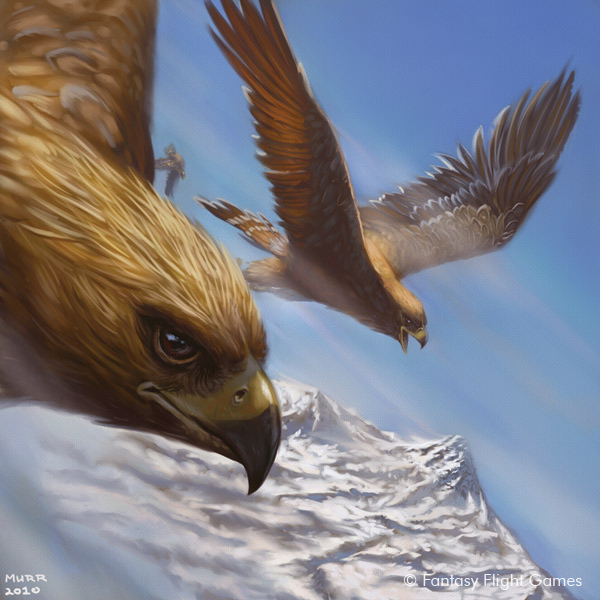 The dwarves, at least of Durin’s line, also practice this art as has already been noted. 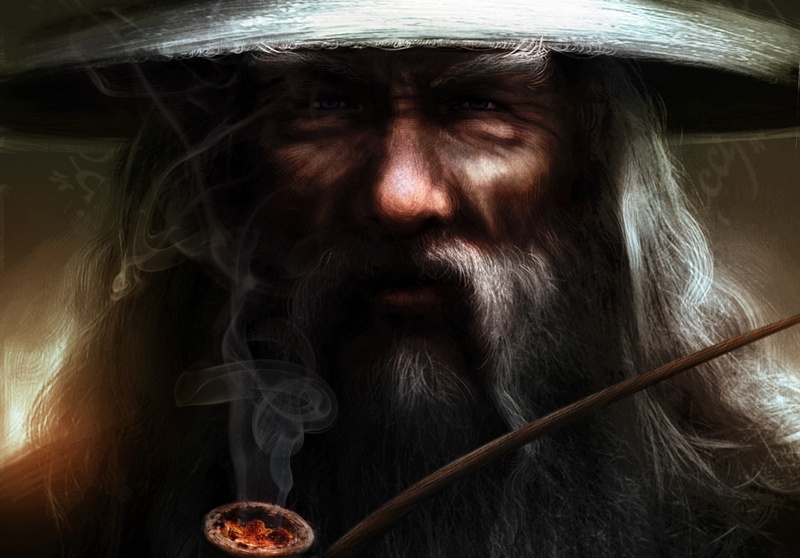 All of the twelve dwarves of The Hobbit seem to smoke and the tradition passed from Glóin to his son. Gimli, in the very same scene with Legolas above, is perhaps the most anxious of all to get into Saruman‘s stores of Longbottom Leaf. The dwarves take passionately all they put their minds too, so it should be no surprise that they certainly rivaled Hobbits and Wizards for the most prodigious of smoke-ring blowers. Speaking of Saruman, he is a particularly interesting study. The Wizard of Many Colours began importing leaf from the Southfarthing to Isengard shortly before the War, sending his spies to negotiate the distant purchase. 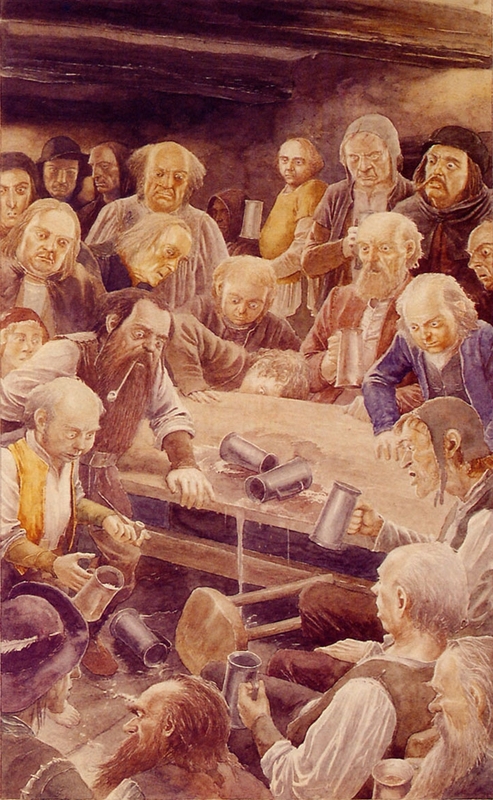 Going back again to Flotsam and Jetsam, when they discover the stores of pipe-weed Pippin says that ‘there were the Horblower brandmarks on the barrels, as plain as plain. How it came here, I can’t imagine. For Saruman’s private use I fancy.’ We learn in Unfinished Tales that this may be because he was emulating Gandalf. 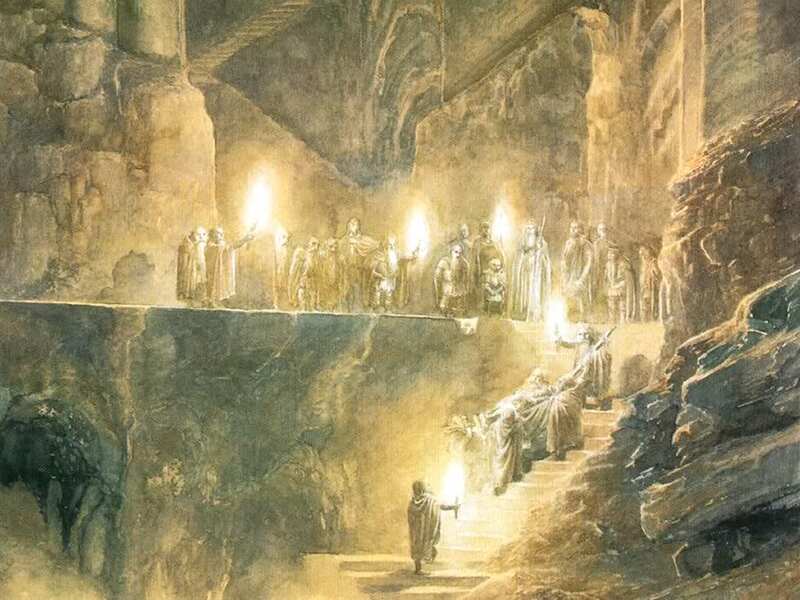 The pipe and leaf become an odd, cross-cultural tradition in The Lord of the Rings, where even the passing off of a pouch from Pippin to Saruman and Grima is a great act of kindness. This deck seeks to have some thematic fun with the limited selections we have for smoking pipes. Since its first appearance in The Black Riders box, smoking has been limited to hobbits. But The Road Darkens has spread it out a bit to allow for Wizards to enjoy the gentle art. I know that designers Caleb and Matt are big fans of the all the nuances of the book, so I hope and expect to see the Pipe trait expand as the game goes on. Lost Realm is the next big box, focusing on the Rangers of the North, so surely we will see a ‘Ranger Pipe’ or somesuch, and I’m honestly surprised that room has not yet been made for a ‘Dwarf Pipe’. So the deck incorporates Hobbits, Dwarves, Rangers, Men, and Wizards into a pretty solid questing/support deck. The deck has some clear strengths and weaknesses and presented some challenging deck-building decisions. For starters, I knew I had to put in Gandalf to make good use of all of his new toys, not the least of which being Wizard’s Pipe. That left two slots that I wanted to be Spirit Hobbits: not exactly a second breakfast’s worth of options. Despite excluding the deck from Saga play, Frodo was the obvious choice — interestingly enough, though, I don’t think Frodo is ever clearly stated to be smoking at any point in the books. Certainly he does in the movie, but I could not think of or find a direct quote from the text where he is using a pipe. Next, do I putty in Fatty Bolger, with a rather situational ability, as a mediocre defender for the Spirit match? Or (Spirit) Pippin with an absolutely useless ability? I opted for Fredegar in the first iteration but I really needed a questing hero and Pippin kept calling my name. Although Merry is the academic, having written most of the stuff down in the Red Book, Pippin remains lodged in my mind as the passionate expert of the pipe. Dare I crossover and use his Lore version, breaking what should be a primarily Spirit deck? I tried it and made a few alterations and it works, but it takes time for the resource situation to sort itself out. I also considered dwarves, as they had to be included in the deck, but it was too diluted. One dwarf hero, unable to use a pipe, was not enough to trigger the ‘when 5 dwarves are in play’ effects and the other option was to go dwarf-wild, which would nuke the thematic intent. This made me sad, as Ori is one of the few heroes depicted as smoking. Still some big names remained in the deck to fill in some gaps for questing and defending (and smoking, of course). The final consideration was Strider (Lore-Agorn) as he is also actually smoking in the image and a powerful hero in his own right. He may have been a better call, but that is some very high starting threat and it would eclipse my favorites — the Hobbits. Unexpected Courage, of course, will get you extra actions out of the very powerful Gandalf and should be played as soon as possible. But between him, the Hobbits, and their allies you will quest well and should be able to lots of ‘regular’ quests, though more playtesting is required. There is so much more that can be said about pipes and smoking in the books and many more ways to round out this deck. I cannot wait to see where the Pipe trait takes us in the future, but until then let’s make the most with what we’ve got! Love the idea, but it’s too bad this won’t work for BR and RD because of Frodo. Any chance this works with Fatty? You know, it just might. Fellowship Frodo would fill in the willpower gap solo, and in multiplayer the other decks should be able to cover this deck’s weaknesses. Well, come on, why Courage yet again? Just leave that card be, replace it with something thematic, and have more fun. Even Miruvor can work just as well, or better, and it fits the theme well. More Word of Command, I would say, also. I’m not convinced that Miruvor is any more appropriate, thematically, than Courage, but I do agree that Miruvor would be more fun and feel more apropos for this deck. 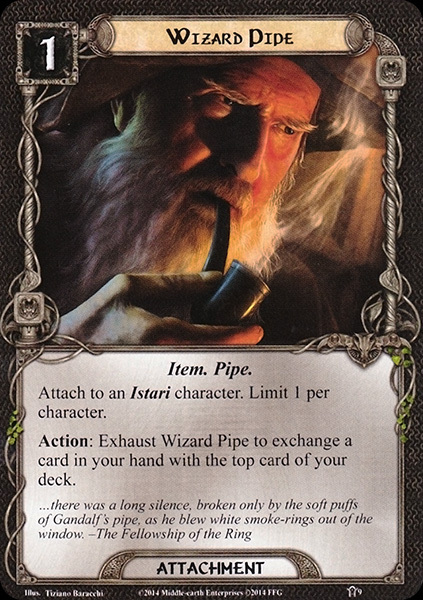 Gandalf and his Pipe mean lots of options and cards going back and forth, so Miruvor just might be the better fit. 1 cost is better as well. Fantastic article and fun-looking deck Derek. If I ever get out of the swampy Nîn-in-Eilph that my work has become, I’m eager to give something like a try. Still hoping to get OCTGN one of these days! I really love you, Shipwreck and Master of Lore, working together on this blog. You impersonated one of the red lines (rode draad in Dutch, but my translating skills lack a bit with our sayings) of Tolkien’s stories. You’re very kind, Diedert! Thank you! Well done! I’m going with your interpretation. Nicely done! Just one question: Where did you get that alternate art Frodo? Is it from a GenCon quest? Tom (GeckoTH) made it for Octgn use. I’m not sure where he got the image from.